An armored personnel carrier used by U.S. troops to fight insurgents on the battlefield is making its way to the University of California thanks to a $200,000 dollar grant from the Department of Homeland Security. “The eight-ton vehicle, commonly referred to as a “Bearcat,” is used by U.S. troops on the battlefield and is often equipped with a rotating roof hatch, powered turrets, gun ports, a battering ram, and a weapon system used to remotely engage a target with lethal force,” writes Campus Reform’s Josiah Ryan. UCPD spokesman Lt. Eric Tejada justified the purchase by pointing to an event last year when a man was reported to be carrying an AK-47 assault rifle on campus, despite the fact that the incident turned out to be a false alarm. University of Virginia Professor Dewey Cornell slammed the purchase as overkill, pointing out that the average U.S. college has a homicide only about once every 480 years on average. The Bearcat is being provided to law enforcement agencies across the country by means of grants obtained under the DHS’s Urban Areas Security Initiative. 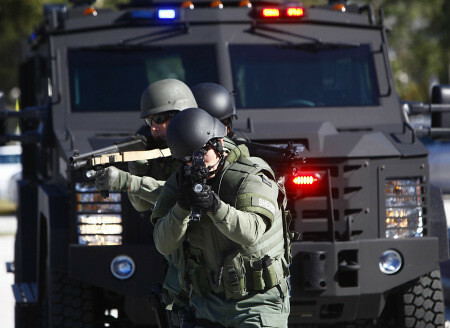 When Keene City Council accepted a $285,933 Homeland Security grant to purchase one of the vehicles back in 2007, it caused uproar amongst residents of the New Hampshire town, who complained that the APC was a sign that the small city’s police force was being militarized. Larry Welkowitz, a Professor of Psychology at Keene State College, labeled the purchase “catastrophic thinking,” noting that the government was exploiting a culture of fear to militarize domestic law enforcement.